A woodworking lathe is a specialized woodworking machine, they are not for everyone, but they can be extremely rewarding. Lathe woodworking is the most fluid form of woodworking and once started can be addictive. Whether you turn pens, bowls, sculpt or make legs and parts for furniture it can be very satisfying to see the material change as you engage the cutters. Capacity is the first thing you look at on a wood lathe; it controls what you can make and how you make it. If a lathe has a length capacity of 36” that is the longest you can turn in one piece. You can go longer but you must do it in separate sections and join them afterwards. If a woodworking lathe is rated having a 12” swing over the bed it means the distance from the bed to the center of the drive is 6”. So, the largest diameter of bowl your can turn is 12”. Keep in mind the swing over the tool rest will be less. Some lathes have an out board spindle or the drive head itself swivels 180 degrees. This means there is no bed limitation and you can turn a much larger bowl. If all you want to do is pen, pencil, fob, etc turning you do not need a full size lathe. Almost any bench top model will be fine with capacities from 8” to 15”. If you want to turn other things as well you need to go to a full size lathe and the most common is a 12” x 36”. For bowl turning you will want one that has a swiveling head or out board spindle. Speed is the next thing to consider. Generally speaking, the more speeds the better. If you are turning large diameter stock or roughing out you need to use a slower speed and the smaller the diameter & as you finish the piece, the faster you can go. Choose a lathe with at least four speeds with the slowest being about 600 rpm (slower if possible) and the fastest being 3200 to 4000 rpm. Some variable speed models can go from zero upwards. The bed of a lathe is important. Small lathes can have an aluminum bed but more commonly they are cast iron, steel bars or steel plates. Whichever the material a bed must be strong and rigid so that there is no flexing as pressure is added and vibration is not increased. Single piece construction is better than a two-piece bed. I have an older (cheaper) lathe and the bed is made of two shorter steel pipes joined end to end to give a 36” capacity. For the most part it is fine for my needs, but there is movement so I have to check the alignment whenever I go to use it and also during use. If I did more wood lathe work it would become quite annoying. If you do purchase a lathe with a two-piece bed, bolt it securely to eliminate as much play as possible. Some accessories will only fit on certain types of beds. If you think you may want to use a certain accessory such as a duplicator, make sure you are not limiting yourself by getting a lathe, which will not accept one. The most common are the cast iron or steel plate beds. These lathes have two flat sides running parallel to each other. Check any cast housings such as the headstock & tail-stock. Make sure the quality of casting is good and there are no cracks hidden by paint. Also, see if there are any obvious weaknesses in the design where you tighten clamps to hold the tail-stock onto the bed. This is constantly moved and clamped, so if something is going to break it will be here. Motor sizes range from the tiny 1/8HP up to 2HP and larger. The most common size for home use will be between 1/2HP and 1HP. Industrial use would be from 3/4HP and up depending on the need. I find the 1/2HP is just a little light when turning anything larger than a 2” spindle or small bowl, but it can still do the job, you just need to take your time. Most lathes come with some basic accessories such as drive center, live center and a faceplate. If your lathe does not come with a live center you should buy this. If you are doing bowl, cup, plate, etc. turning you will need a 4-jawed chuck. For turning tools get as good as you can afford. Poor quality turning tools are very discouraging because they dull quickly and you are forever sharpening. You can get sets specifically for pen, or small turning, but for general work a basic 6-piece set is fine and will cover the majority of your needs. You can always add to it over time. 1. Size. 8” to 43” long by 3” to 20” swing. Some of the industrial are longer or have extensions. Make sure it will have enough capacity to do what you want it to. 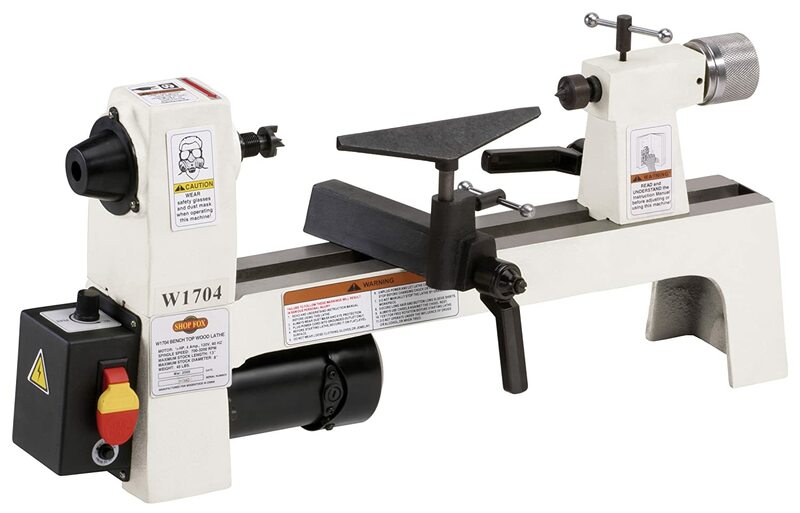 Some newer bench top lathes have extensions available to double their length capacity. 2. Motor. Check the horsepower and amps. You’ll need both when comparing. Motors can range from 1/8HP up to 2HP. For small work 1/2HP or small is fine, for general-purpose use 1/2HP to 1HP and for industrial from 3/4HP and up. 3. Speeds. Avoid single speed lathes if you can. A basic range is from 600 to 4000rpm. General rules of thumb are the larger the piece the slower you go as well as slower when roughing it out and faster as you finish. 4. Bench or floor model. You need to take into account space and capacity. All small lathes are bench tops but you can make or buy a stand for them. Most full size lathes have a stand included or have one available. 5. The bed needs to be stable and solid. A single piece bed is better than two-piece, however extra bolts and support can secure a two-piece bed. 6. Does the head stock swivel or is there an outboard spindle for large bowl turning. 7. If the bed and housing are cast material, make sure the casting is of good quality and there are no visible cracks. 8. Check that there is no design weakness where the tail-stock clamps to the bed. 9. Where is the power switch located and is it easy to reach? Switches in awkward places can be a safety hazard. 10. Where is it made and where do you get parts & service? There are some excellent offshore machines out there but you have to be careful because there are also some bad ones. Check the brand and the company you are buying from and find out exactly where you can get servicing done. You are the one paying for it and using it, so find out as much as you can before you make the purchase so you will not have any regrets. And remember, no loose clothing and no jewelry, wear short sleeves, safety glasses and hearing protection.